It’s the eighth book in the series and a Junior Library Guild selection. There's a new king on the playground! EllRay’s class is brimming with possibilities, but no one seems to share his interests. 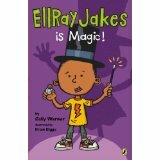 But EllRay isn’t worried – he can fix any problems once he gets to know each kid. And the only way to get to know them is to come up with fun things to do at recess. When he’s the Recess King, everyone will want to be his friend! With an ear for spot-on kid dialogue, Sally Warner explores the topic of shifting friendships in a fresh (and funny!) way. Coming Soon — the Alfie Jakes series.